June 27, 2011 – Head Coach Kevin Magee from Comeaux High School in Lafayette has a really good resume. Coach Magee played at Leesville High School in 1977, signed with Louisiana Tech for football and finished at Northwestern State. Kevin Magee learned from one of the best coaches in Louisiana high school football, current coach and legend Lewis Cook from Notre Dame of Crowley. From 1982 to 1996 Magee was an assistant coach under Cook at Crowley High School. Kevin then spent several years at his alma mater Leesville High School, and he now enters his second year at Comeaux as head football coach. Coach told me an interesting fact about Leesville High School which has many military parents from the U.S. Army from all over the country at the school. He said, “I was at Leesville High school as a coach, Lee, and we lost as many as 52 players that left the program due to their parents being transferred to other military bases in the United States in a 4 year span before their senior year of football.” I found that very interesting because it’s hard to build a team and to win a bunch of games every year when you keep losing kids before they can finish their senior season. Kevin Magee enters his second year as head football coach at Comeaux High School, which has had some great players come through the program over the years; most notably WR Brandon Stockley, who still currently plays in the NFL for the Seattle Seahawks. I feel like this team will be improved from their 1-9 record from a year ago. This team also has a great staff. Offensive Line coach Ronald Gunner, who played at USL as an Offensive Lineman in 1994 and blocked for QB Jake Delhomme coached with Magee at Crowley High School one year in 1996. Assistant Mark Mawae whose brother is NFL great Kevin Mawee was an assistant with Magee at Leesville High School. Keith Bergeron was head coach at Rayne from 1995 to 2005 and coached Josh Reed from LSU who played a few years for the Buffalo Bills in the NFL. Assistant Matt McCullough is the son of Acadiana long time Assistant Scott McCullough. I enjoyed talking to Kevin Magee and all of the Assistant coaches as well as the players while I was there. 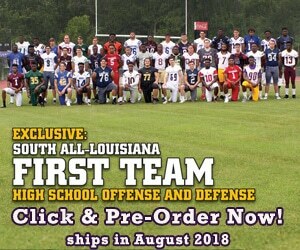 We will have more on the Comeaux High School Spartans in our 2011 Louisiana Football Magazine preview issue which you can pre-order now at www.lafootballmagazine.com/store.